We Shudh Jivan Retail Pvt. 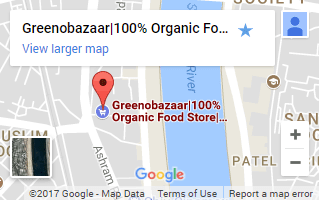 Ltd. OPC the parent company of www.greenobazaar.com (”Shudh Jivan Retail ”,"Greenobazaar”, “Greeno” , "we," "us," or "our") value our users and customers privacy as seriously as themselves and care about how your personal information is used and shared. In certain situations, businesses or third party websites we’re affiliated with may sell items or provide services to you through the Website (either alone or jointly with us). You can recognize when an affiliated business is associated with such a transaction or service, and we will share your Personal Information with that affiliated business only to the extent that we deem it related to such transaction or service. One such service may include the ability for you to automatically transmit information from your Shudh Jivan Retail account to an account on a third party website or service, such as Facebook. We have no control over the policies and practices of third party websites or businesses as to privacy or anything else, so if you choose to take part in any transaction or service relating to an affiliated website or business, please review all such business’s or websites’ policies. Your account is protected by a password for your privacy and security. If you access your account via Facebook Connect or Gmail or google+ or twitter, you may have additional or different sign-on protections through the one you connected. You need to prevent unauthorized access to your account and Personal Information by selecting and protecting your password (or other sign-on protections) appropriately and limiting access to your computer or device by signing off after you have finished accessing your account. 5. What Personal Information can I access and change? The information you can view and update may change as the Website changes. If you have any questions about viewing or updating information we have on file about you, please contact us at greeno@Greenobazaar.com. 6. How can I protect my personal details? You can always elect not to disclose information to us. However, please keep in mind that we may need some information to allow you register with us or to take advantage of some or all of our features. You may be able to add, update, or delete information as explained in Section 5 above. When you update information, however, we may maintain a copy of the unrevised information in our records. You may request deletion of your account by visiting your account settings. Please note that some information may remain in our private records after your deletion of such information from your account. We may use any aggregated data derived from or incorporating your Personal Information even if you update or delete it, but we will not use that information in a manner that would identify you personally.